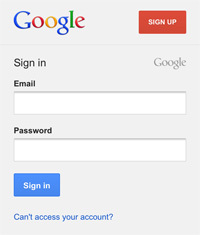 Google uses OAuth to authenticate users of their API. 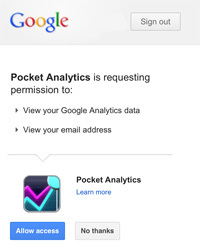 This means that we will open a web browser within Pocket Analytics where you can log in to Google. You will then be asked to grant Pocket Analytics access to your Google Analytics Data and your email address. We ask for access to your email address so that we can identify your account to you - it is encrypted on the device, and never sent anywhere. Once permission is granted, Google will provide an Access Token to Pocket Analytics, which will be used in all future communication to retrieve data from Google. Note that these Access Tokens eventually expire. When they expire, you can simply re-authorize yourself, and you will immediately have access to all your data again. If you edit your properties in Google (i.e. add/remove a site / mobile app), just come back to the account, and tap "Refresh Account Profiles...". All communication with the Google Analytics API is encrypted using https. All sensitive information is encrypted on the the device. For websites, Pocket Analytics will try to use the favicon.ico from your website. If none can be found, then it will look in the index file for shortcut icons, and use one if found. For iOS apps, Pocket Analytics will use the profile name to search the App Store for a match. If one is found, then it's icon will be used. Note that the profile name needs to exactly match your app store name in order for this lookup to work. For Android apps, Pocket Analytics will just use a generic icon, since there is no comprehensive web service for looking up app icons. Please take a moment and help spread the word by posting a review in the Google Analytics Application Gallery!